There are currently over 25 million households in the UK, with plenty of buildings over fifty years old, many of which contain stairs. This is not a problem when you have no difficulty climbing stairs but if – for whatever reason – even a couple of steps become a consideration, barrier or physical hazard, your own home can suddenly quite seriously disable you. When this happens, you are left with four choices: do nothing and lose the ability to live independently in your own home; reorganise the house to live and sleep downstairs; move to a bungalow or ground floor flat; or install some form of domestic lift. The last option is likely to be the least distressing, and the most practical and financially prudent means of ensuring you retain as much independence as possible. Any bonafide company will complete a thorough survey before presenting you with available options. It is important to recognise that this should not be a sales meeting. Fixed stairlifts are powered mechanisms mounted on stair-fixed tracks, which follow the line of the stairwell. They can either be straight or curved. The majority of stairlifts are used by people who can walk but find stairs a problem. 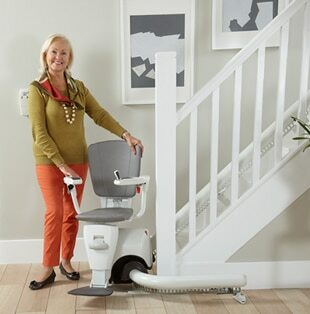 If you opt for a stairlift, there are a number of things you will need to consider. Would you find it easier to use joysticks and toggle controls, or buttons and switches on the end of the armrest, or on a remote-control unit? You need to take into consideration the home environment, not just in relation to the physical things like doors, bulkheads and radiators, but also family members, pets and visitors. Where will the stairlift be parked when not in use? but you will have less choice if you have a curved, spiral or unusually shaped staircase. All manufacturers make lifts for straight stairs giving you many models to choose from. With stairways that turn at the top for a few steps, you might feel able to get off the lift and walk up the last few steps, but you need to decide if you are likely to be able to go on doing this in the future. Think about how much room you need for your knees or feet. Perching and standing lifts are now frowned upon and you will find that most manufacturers have steered away from these. 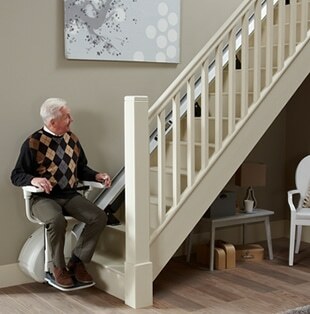 Some stairlifts have the ability to rotate themselves through narrower gaps with some having the ability to travel completely forwards or backwards should it be needed, and these can be installed on narrower stairs, which means there is no danger of bumping your knees or feet. Narrower stairways may mean the lift gets in the way of the other people using the stairs, it is advised to consider parking positions for when the stairlift is not in use. If other people use the stairs and or you have a narrow hall and landing, you will probably need to fold the lift when you are not using it. The seats, armrests and footrests fold on all models, however each model can work differently. It is advised to check how each one works and what will be suitable to you now and in the future. Controls: On all stairlifts the controls are usually on the armrest – either on the top or on the end. You can choose wherethe controls are located model by model but make sure that it is not where you might accidentally switch it on when you are getting on or off or where other people walking by can easily catch the controls. This can be a problem if your hand slips easily, you have arthritic or similar conditions in your hands, or if you make involuntary movements. Have a look at all options and try to choose a model that has different control options as they may need changing over time. Transfer: Which position will the seat be at, and what height to enable a safe and manageable transfer to and from the stairlift. It is advisable wherever possible to be as far away as possible from the stairs, at the top of the stairs, and to also consider whether seat and footrest heights can be altered in the future should your needs or requirements change. Remote controls: It is advisable to check which frequencies or signals the remote controls and if required attendant controls work on and can these be changed if they become problematic. The majority of stairlifts remote controls work on infra-red, and it has been known for low voltage lighting, sky tv controls and similar items to effect these. Situations like this can be determined as environmental conditions and therefore be excluded from warranties. Some Stairlifts work on fixed radio frequencies and have multiple channels, these options can avoid the issues already mentioned. Some stairlifts have an option for both infra-red and radio frequency and they will select the most appropriate for your environment. It is advised also to investigate whether the remote controls are programable as your requirement might be to select certain parking areas for when not in use, or specific seat angle rotations. Will the batteries that power the remote controls be changed annually during the service, or will there be an additional charge for this? Not all user changeable batteries are simple to change. Safety Belts: All the stairlifts will be supplied with a seatbelt. The seatbelts can differ in style and connection type. It is advised to select a type that will be suitable for your use and ability. Most manufacturers also offer a harness option. It is also worth considering curved arm options which are offered by a number of manufacturers now as these can offer an extra layer of security and safety to the user. Safety Features: Whilst all stairlifts have a minimum level of safety features as required by governing bodies as standard, it is worth investigating the full level available on all models. Whilst the safety in some circumstances protects the lift, some models are also designed to protect the user, for example should they have an arm or a leg in a position that may catch an obstruction on the stairs. Some will have smart battery monitoring and emergency lowering systems included as standard, meaning that you will not end up stuck mid flight and should always be able to get to a designated safe point, usually the ground floor. It is advisable to consider all safety aspects including the ability to self-monitor. Installation itself is usually completed within a day, with straight stairlifts having an average installation time of 2.5 hours and curved stairlifts averaging at 5 hours. As each staircase and installation is unique, timings can vary. You might not be able to use the stairs while the work is being done. If you buy a stairlift direct from the manufacturer or an authorised distributor, they will deliver and install it. This will include all electrical work and any ancillary work that might be required; for example, the removal of any obstructions that may hinder operation on the stairway, such as a handrail. Ask the supplier what alterations will be needed, if any, and who will be responsible for them, including any making good. Ordering from a manufacturer will limit you to a choice of their own lift. Using an independent specialist, will allow choices from across a range of manufacturers. Pricing; Much like any other product where differences can exist, prices can vary. Be aware of “on the spot” discounts, and price matching offers. Bona fide suppliers will offer fair prices from the off and will not be discounting whilst sitting with you or after their visit. They will happily leave you with their findings, assessment findings and a fixed quotation. It is advised that you gain at the minimum two quotations, if not three, and take the time to consider all options before making any decisions. It is advisable to be alert to and aware of sales tactics that can be used to entice an immediate decision. A bona fide company will not pressure you for a decision, especially on their first visit unless there are financial incentives in place for them as individuals. This is generally an extension of the guarantee. The cost varies between companies and is dependent on how many years’ cover you opt for. It is advisable to gain this information in advance as some companies will charge as much £600 per year. This is a cheaper alternative to an extended warranty. It may be the only option available for lifts bought second hand. Services are booked usually once a year. The cost covers labour, but you will have to pay for any replacement parts. If the lift breaks down and you don’t have a maintenance contract, you will need to call out the manufacturer, retailer, or a repair firm. Before taking on any type of maintenance contract, check when the firm is ‘on call’ and that engineers are always available, not just the office staff or a call centre. The warranties offered by stairlift firms cover the lift only for mechanical failure. If you want cover against accidental damage, fire, or flooding, you will need to take out insurance on the lift. Insurance companies vary in whether they insure stairlifts under contents or buildings policies, or indeed at all. Always tell your insurance company when you are having a stairlift installed. Specialist insurers can give specific policies for stairlifts. Information on these can be acquired from your supplier.